For most people, sunscreen is just one of life's many minor inconveniences that are necessary to avoid cancer and scalding pain. But do you really know how it works? It's incredible, if you think about it: smear this goo on, and the sun, which is necessary for life, won't kill you. Suffice to say that you probably don't know much about SPF, or when you should reapply. 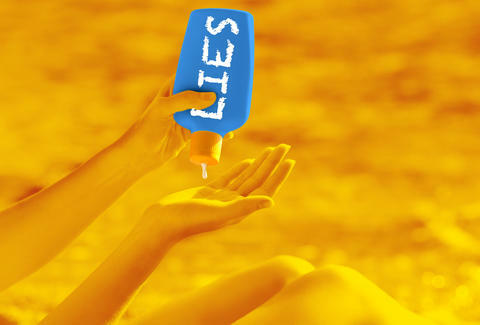 Here are some of the biggest myths about sunscreen, dispelled by Dr. Ingrid C. Polcari, an assistant professor in the Department of Dermatology at the University of Minnesota Medical School. SPF means sun protection factor, and the number stands for how long you should be able to hang out in the sun before you burn compared to if you weren't wearing any protection. So if you've got on SPF 15, you should be able to stay in the sun 15 times longer than you would without any sunscreen on at all, says Polcari. Regardless, most sunscreens will tell you to reapply every two hours. So higher SPFs must mean better protection, right? Well, this is a gray area. The FDA doesn't have enough proof to confirm that sunscreen with an SPF higher than 50 actually provides extra protection, and they actually want to make it against regulations to claim any SPF higher than 50+. Meanwhile, Polcari says that higher sunscreens do offer a very small increase -- SPF 30 blocks out 97% of the sun's UVB rays, while SPF 60 blocks out just 1.5% more. So while you doubled the SPF number, the amount of extra protection you get is minimal. If you're reapplying SPF 30 or higher frequently, you should be in good shape. The most dangerous rays the sun emits are UVA and UVB, though they aren't the only ones. "Although it is a slight oversimplification, UVA can be thought of as aging rays, and UVB as burning rays," says Polcari. Though both contribute to skin cancer, SPF only offers protection from UVB. To be protected from both, you'll want a bottle with the term "broad spectrum" on it, and while SPF only refers to UVB, the FDA says higher SPF numbers also correspond to higher overall protection. With most things in life, you get what you pay for. Sunscreen is not an exception, because manufacturers use different active ingredients in different combinations to get their own form of "broad spectrum" protection. "This is why you might tolerate one type of sunscreen, but get a rash from another," says Polcari. The average person is supposed to use 1oz of sunscreen to cover their whole body. In terms you're more likely to understand, that's basically a shot glass of lotion. When you use a spray, the amount you're applying isn't exactly obvious, and you're more likely to miss an area of your skin, or if it's windy, a whole body part. There are also concerns that you could inhale the product during application. In fact, the FDA does not recommend sprays for children. Everything you were told as a child getting your pants pulled down playfully by a dog is a big lie: as of 2012, companies aren't allowed to put "waterproof" on their labels, says Polcari. Instead, you may see "water resistant," with a max protection time. A good rule of thumb: if you take a dip, reapply after. Note that this also applies if you're sweating it up during beach aerobics. Smearing on the white stuff is really just one way to keep yourself protected. Polcari also suggests hanging in the shade, wearing sun-protective clothing and swimwear, and grabbing a hat with at least a 2in brim. And remember, the sun is at its strongest between the hours of 10am and 2pm. Melanoma is still a fairly mysterious form of cancer. According to the Mayo Clinic, the exact cause isn't clear, though exposure to ultraviolet radiation certainly doesn't help. While sunscreen does play a role in helping prevent melanoma, it isn't the full answer, and families of melanoma often appear in places that don't see much sun exposure. Sunscreen does protect you from basal cell carcinoma and squamous cell carcinoma, so it's definitely still worth using. Just keep a close watch on any moles you have. Depends. The shelf life of sunscreen is three years. If your bottle doesn't have an expiration date, sharpie the date you open it on the bottle. But honestly, if you apply enough, you should never have a bottle last this long. The difference is in the vocab, and the products' chemical makeup. Sunscreen is sheer after application, and filters the sun's rays so that your skin absorbs less. Sunblock is thicker, still visible after application, and blocks the sun's rays -- it's the white stuff that lifeguards in teen movies wear on their noses. Bottom line is that if you're planning on spending any -- yes, any -- time outside this summer, you're going to want to apply and reapply, because skin cancer tends to put a damper on beach time. Kristin Schwab writes about health, fitness, and the arts. Writing this story officially scared her into taking her sunscreen shopping a little more seriously. Follow her on Twitter: @kkschwab.